Jihadists seize Jisr al-Shughur, last major city under regime control in Idlib; now closer than ever to regime heartland Latakia. Al Qaeda's Syrian affiliate and its allies seized the last major government-held city in Idlib province on Saturday, in a blow that could expose the regime's coastal heartland to rebel attack. The capture of Jisr al-Shughur in the northwestern province comes nearly a month after the same coalition of opposition forces, known as the "Army of Conquest," overran the provincial capital. The city's fall opens up a strategic assault route for the rebels to neighboring Latakia province on the Mediterranean coast, a bastion of President Bashar al-Assad's regime, analysts said. 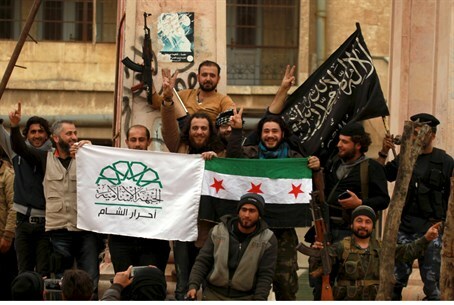 "(Al-Qaeda affiliate) Al-Nusra Front and the Islamist brigades now have complete control of Jisr al-Shughur," Syrian Observatory for Human Rights chief Rami Abdel Rahman told AFP. "There are some ongoing battles outside the city, to the south and east." The Britain-based monitoring group said the bodies of at least 60 regime loyalists had been seen on the streets of the city, which was overrun by thousands of rebels. Syrian state media did not acknowledge the city's fall, saying only that "units from our valiant army successfully redeployed on the outskirts of Jisr al-Shughur to avoid casualties among innocent civilians." State news agency SANA said "aircraft bombed groups of terrorists in the Jisr al-Shughur region, and destroyed dozens of military vehicles and killed terrorists." The jihadists hailed victory on their official Twitter account. "The mujahedeen have entered the city centre. The city has been liberated," Al-Nusra said. One of the group's official accounts published multiple photographs of Al-Nusra fighters in the city, some holding their black flag and others reciting "prayers of thanks" for the city's capture. Jisr al-Shughur became the regime's de facto provincial capital after the Army of Conquest coalition overran Idlib city last month. With the loss of Jisr al-Shughur, the regime holds only a few areas in the east of the province, including the town of Ariha, a military base in Al-Mastumah and an air base at Abu Duhur. But an activist from Idlib told AFP that both Ariha and the Al-Mastumah base were now under rebel siege, along with another military base called Al-Qarmid. While last month's capture of Idlib city was hailed by many in the opposition because it was only the second provincial capital entirely lost by the regime, the seizure of Jisr al-Shughur may prove to be strategically more important. "This city is more important than Idlib city because it is close to Latakia province and regions controlled by the regime in the northeast part of Hama province," Abdel Rahman said. It lies on the road leading to the regime's Latakia bastion, and is also close to the border with Turkey, which is a leading backer of the uprising against Assad. "For the opposition as a whole, it would open up the route into Latakia from Idlib and Hama, which could significantly enhance any future offensive on Latakia," said Charles Lister, a visiting fellow at Brookings Doha Centre and a Syria specialist. "That would be very dangerous for the regime." He said the capture could also pose a new threat to the regime in neighboring Aleppo province, which lies to the east of Idlib. "At the end of the day, this needs to be seen as more than just an offensive on Jisr al-Shughur, there's a much bigger strategy playing out."